This division is responsible for traffic enforcement throughout the City of Newark along with providing coverage for special events. Furthermore, this division is stationed in the downtown area of Newark which encompasses Newark's main business thoroughfare, Prudential Center Arena, NJPAC, Symphony Hall and Riverfront Stadium. 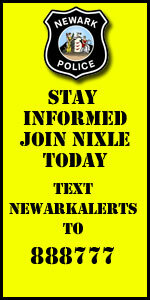 See the most recent messages from City of Newark Police Department, powered by Nixle.